Managers at Lincolnshire hospitals are to postpone non-urgent appointments for a second day and tomorrow (Friday) as well due to the ongoing snowy conditions making it difficult for staff and patients to travel. 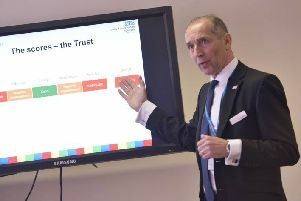 In an announcement just issued, Mark Brassington, United Lincolnshire Hospitals Trust Chief Operating Officer, said: “To protect the safety of our patients, today (Thursday March 1) and tomorrow (Friday March 2) ULHT is unfortunately cancelling all non-urgent outpatient clinics and operations. Many of our staff haven’t been able to get into work due to the adverse weather conditions and we don’t want patients to risk their safety by travelling to one of our hospitals for a routine appointment. People who have an operation scheduled are being contacted if their operation has been cancelled, but all non-emergency operations that are being cancelled, to be rearranged “as soon as it is safe to do so”. As previously reported, many staff have walked into work or got lifts in 4x4s, or stayed over locally with friends closer to the hospitals in Boston, Lincoln and Grantham. At Pilgrim Hospital, a 4x4 driver went out picking staff up but had to turn back as they could not get through, but before doing so he helped two other drivers he came across who had gone off the road and also checked a car in the dyke was empty. Mr Brassington said: “Please stay safe and keep away from hospitals unless it is an emergency. Getting to our hospitals is tricky and the conditions may be treacherous. He said: “Please consider whether you may be able to self-care your condition through over-the-counter medicine, staying warm, hydrated and through resting.​ You can receive further help and advice on what the best remedy is for you, from your local walk-in pharmacy. The hospital trust will publish further updates on Twitter @ULHT_News and Facebook @unitedlincolnshirehospitalsnhstrust.